Language translator services are easily accessible online in the modern era, so you might be wondering why you’d need to use a professional instead. However, although Google may seem to offer a miracle solution, there’s often much lacking from these automated options that are so readily available. You may be lucky, and these very literal translations may hit the mark and offer an accurate text, but in many cases they can miss the underlying meaning of the words, leaving the audience bemused. Here’s a brief overview of the extra value that professional translation services provide and why they are so much better. English and French are two of the most important languages in the world, both being widely used by the United Nations and other global bodies. Nevertheless, there are occasions where the translation of English to French is necessary, or vice versa, and it’s not as simple as it looks. Translating one word at a time by using a thesaurus or dictionary is not a true language translation, and this can lead to inaccuracies. This is where a professional language translator has the edge on an automated tool, as they’re able to look at the wider meaning and consider translations that may not be quite so literal. Different variations on a language also exist when working to translate English to French. For example, the French spoken in Paris may sound distinct and different to the dialect spoken in Canada. A professional translator will be able to select the most appropriate French style to use, whether that's Canadian, Parisian, Belgian, French Flemish or something else. The French language also tends to be approximately 15-20% longer than its equivalent English text. If there’s a need for a specific word count, a translator can provide this without losing the context. 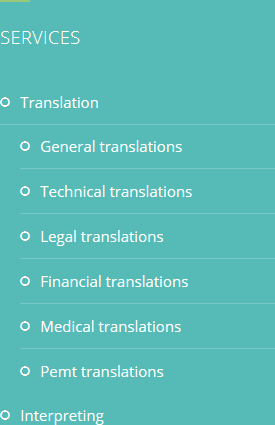 These are all services that can’t be easily offered by an automated translation tool. Both English and French words and phrases have a long history and have evolved over time, creating languages that are as beautiful as they are complex. Despite having different roots, there are some apparent similarities between the two languages, which cause difficulties with English to French translation. This is because as a Romance language, French is in part evolved from Latin, an ancient tongue which also influenced English. These similarities may make it seem simpler to translate between the two languages, with some words appearing almost identical. However, there are pitfalls awaiting the inexperienced translator because French and English have couplets of words or phrases that are known as “false friends”. False friends are words that would on first glance appear to be the same but actually have a very different meaning. Examples of this include the simple “blesser”, a word that would seem to have an obvious interpretation. But, in fact, blesser means almost the opposite to the English “bless”, instead being correctly translated as “hurt”. Although there are a growing number of words that are the same on both sides of the English Channel, there is still a significant quantity of these “false friends”, which make the job of English to French translators challenging. Regardless of whether a translation tool or a human translator is being used, if there’s no overarching knowledge of culture and common references, some rather bizarre translations could occur. Faire l’andouille is a phrase that quite literally translates as “to make the sausage” and indeed, une andouille is a smoked pork sausage. However, when used colloquially, it refers to doing something foolish, or a person that is acting like a buffoon. This is just one example, but there are many others in the French language that require more than just the understanding of the written word. In order to convey the true context, it’s essential that the French to English online translator has experience and knowledge of the culture too. This particular challenge isn’t just present for French to English translation; it works in reverse too. Both languages have peculiar sayings and phrases that sound very different when a more literal meaning is attached. And, of course, there are some phrases that are used in both languages that could sound faintly ridiculous elsewhere but are perfectly understood when translated into both the English and French language. An example of this is “être bien dans sa peau”, which translates into English as feeling good in one’s skin. In a world where boundaries are being constantly erased, and the desire to trade and communicate globally is growing, the need for professional translation services is infinitely expanding. Although many businesses may speak English, having the ability to work in another tongue, such as French, can be a real advantage. As two languages that are at the very forefront of commerce, English French translation is a key attribute for any company to possess. 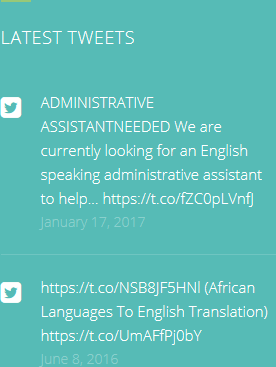 Of course, it may not be financially viable to employ your own in-house translator French English, particularly if the need for their skills is sporadic. An alternative is to use a professional language translator service that can be called upon as and when the need arises. This can help you to keep the translation costs down for your business and also provide you with economies of scale, giving you the option of ramping up volumes if and when required without having to invest in expensive software. 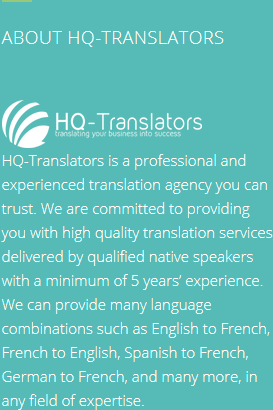 HQ-Translators can provide professional translation services including legal, technical and medical copy, with the emphasis on absolute quality and confidentiality. With such ease of access to the very best translators in the business, there’s no need to compromise and settle for anything less. At HQ-Translators, we only work with the very best professional translators, with every linguist holding more than five years experience. All of our language translator providers only work in their mother tongue and live in their native country, so you always receive a high-quality service. As well as English and French, we provide a whole host of professional translation services, including German, Portuguese, Greek, plus many more. Your business is our priority, so take a look at https://hq-translators.com today. Give us a call on (00 237) 242 71 38 38 or email us at infos@hq-translators.com to see how we could help.